Victor Camarasa's 46th minute goal was looking like a potential winner for a Cardiff side who had battled bravely against Chelsea at CCS. City were making it very uncomfortable for Maurizio Sarri and his team but as the Chelsea fans were calling for their own managers head there was drama. 85 minutes played and Chelsea win a corner. Willian's cross was flicked on by Marucs Alonso and Cesar Azpilicueta headed the ball into the net. 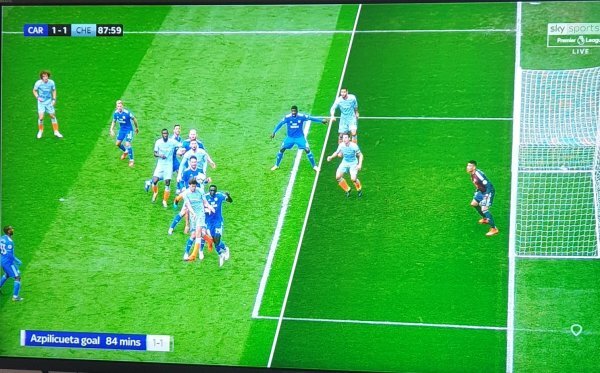 As you can see from the picture below the offside call wasn't even close. The fact the officials missed it and allowed the goal to stand, in the words of Neil Warnock, was 'criminal'. Chelsea were spurred on and as the clock hit 90 minutes Ruben Loftus-Cheek headed the winner. There had been further controversy after Chelsea's leveller. Ken Zohore was taken down as he tried to break free on goal by Antonio Rudiger but the defender was yellow carded for his challenge, possibly the right call but many have said it should have been red. Cardiff were also denied at least two decent penalty shouts for shirt pulling against Sean Morrison. It was a heroic effort from Cardiff and they deserved something from the game. The nature of the defeat knocked the stuffing out of fans and players alike and worldwide there was condemnation of the officiating. On the back of Saturday's results it was a real kick in the teeth after coming so close to winning the game. Still we fight on. Man City away on Wednesday is a free hit but we need to be looking ahead to the games v Burnley, Brighton, Fulham and Palace to secure the points that might see us stay up. We are favourites to go down with Huddersfield and Fulham but not totally out of it yet.